According to most of the participants, the first two games of the Yankees weekend series against the Rays had a playoff-like atmosphere, which is not surprising considering both teams are battling for first place in the AL East. With the two teams set to go their separate ways until mid-September, today’s rubber matchup had all the feel of a vital swing game. That is, to everyone but Yankees manager Joe Girardi, who fielded a “house money” lineup that belied the importance of the game. Lance Berkman was acquired for his bat, but his glove proved to be a deciding factor in today’s loss to the Rays (Photo: Getty Images). With a series victory and two games in the standings on the line, Girardi opted to not only sit Alex Rodriguez, but also Brett Gardner, who ranks ninth in WAR among all American League position players. Just as important as who was missing from the lineup, however, was who was not playing the field. Inexplicably, Girardi opted to further weaken his team by having Mark Teixeira serve as a DH, while Lance Berkman manned the bag at first. 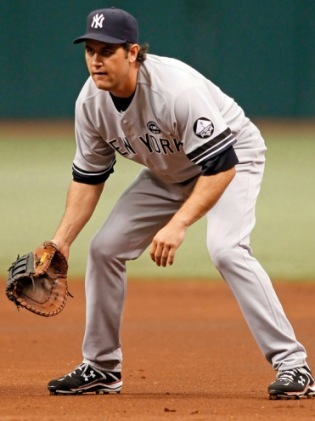 Although Berkman has been a solid defender in the past, age and injuries have severely limited his range, making him a poor substitute for the gold glove Teixeira. It didn’t take long for Girardi’s decision to bite the Yankees. In the second inning, Kelly Shopach hit a soft liner to first that bounced off the outstretched glove of Berkman and landed in right field for an RBI single. The play would have been made easily by Teixeira, but the less than nimble Berkman wasn’t able to get the necessary elevation. Then, in the very next inning, Reid Brignac reached on an infield single when Berkman couldn’t scoop a Robinson Cano throw. The play was another that Teixeira usually makes with ease, and Berkman’s failure do so helped spark a two run rally. The unlucky recipient of Girardi’s lineup decision was C.C. Sabathia, who for the second straight start was felled by poor defense. If not for Berkman’s two misplays, the big lefty could have thrown a shutout, but instead he was left on the hook for another loss after departing with two outs in the seventh. With the Rays out to an early 3-0 lead, James Shield used his tantalizing change to keep the Yankees off balance. At one point, Shields struck out six straight Yankees, five of which were swinging and all on off-speed pitches. In 7 1/3 innings, Shields struck out 11 Yankees, his last coming against Alex Rodriguez, who was pinch hitting for Austin Kearns with one man on and two out in the seventh. The decision to use Arod in that situation further exposed Girardi’s folly. After all, why start Kearns against the righty Shields if you are going to pinch hit for him with another right handed batter? Furthermore, if Arod really needed a day off, what was accomplished by pressing him into duty for three innings? The Yankees’ last glimmer of hope came when Derek Jeter’s line drive single up the middle with one out in the eighth knocked Shields from the game. In another head scratching move by a manager, Joe Maddon then called upon newly acquired reliever Chad Qualls, who had an ERA over 8 while with the Diamondbacks, but Berkman rolled over on a 3-1 sinker and ended his day of futility with a 4-6-3 rally killer. One wonders what would have happened if Nick Swisher, who seems to have lost his spot in the two-hole to Berkman, and Mark Teixeira had gotten their hacks off Qualls, but that’s a second guess for another day. Meanwhile, Kerry Wood also made his Yankees debut, and showed the combination of electric stuff and lack of command that has made him an enigma since his first of many surgeries. After striking out Evan Longoria on a tantalizing hook to end the seventh, Wood struggled in the eighth before being lifted with the bases loaded. In total, Wood threw 26 pitches, a total that seems somewhat high for an often injured pitcher making his return from a three week stint on the DL, but only 12 were strikes. Derek Jeter’s eighth inning single was the 2,866 of his career, tying him with Harold Baines for 40th place on the all-time hit list. C.C. Sabathia was tagged with a loss in August for the first time since dropping a 2-1 complete game decision to the Royals on August 24, 2007. Before this afternoon, Sabathia had not lost consecutive outings since April 27 and May 2 of last year. The Yankees were shutout for the fifth time this season, the last one coming on June 30 against Seattle. If he wanted to rest A-Rod, fine. But to not have your best defensive alignment against Tampa is perplexing. He could have given Tex a rest tonight. Couldn’t agree more. You can come up with a reason for sitting Arod, and to a lesser extent Gardner, but having Berkman play 1B is indefensible, especially because Tex just served as a DH on July 27. Thanks for writing this. Girardi just can prevent himself from over managing to the point of stupidity. 4. Birkman should bat no higher than 7th until he proves himself. He looks fat and out of shape to me. 5. Kearns should play only if the starting outfield sustains an injury or needs rest. 6. Swisher is a proven hitter and should be moved back up in the order. 7. Kerry Wood is totally unreliable. I am one of the few people who think all tree trades weaken the Yankee’s. Hopefully the Steinbrenner sons have the balls of their dad and told Giradi to effin wake up. I would amend your rules to include Berkman should only DH against righties. On nights when Posada catches and a lefty is on the mound, I would prefer to have Thames DH. In fact, I might also consider having Kearns play OF instead of Granderson. Thames is aok at DH. I don’t know much about Kearns but if Granderson continues to struggle put Kearns in and see what he’s got. That said it appears Giradi put his head on straight and went with a more sane line up last night.